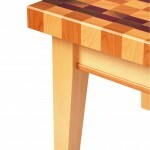 I used European steamed beech for the legs and aprons because of its light colour and calm grain pattern. I also used beech in the tabletop, along with cherry, walnut and purpleheart. A variety of colours provides a nice contrast, but don’t just think about colours when choosing wood; visual textures and grain patterns matter too. I planned my tabletop using coloured markers to draw rows on graph paper, then scissors to cut the drawing “across the grain” into evenly spaced strips. It’s the same process used to make the tabletop. Strips of wood are glued together in the usual way, along their edges, with the subsequent laminations cut, rotated and glued together again with the end-grain pointing upward. The paper process allowed me to alternate strips to see the actual pattern I would achieve. 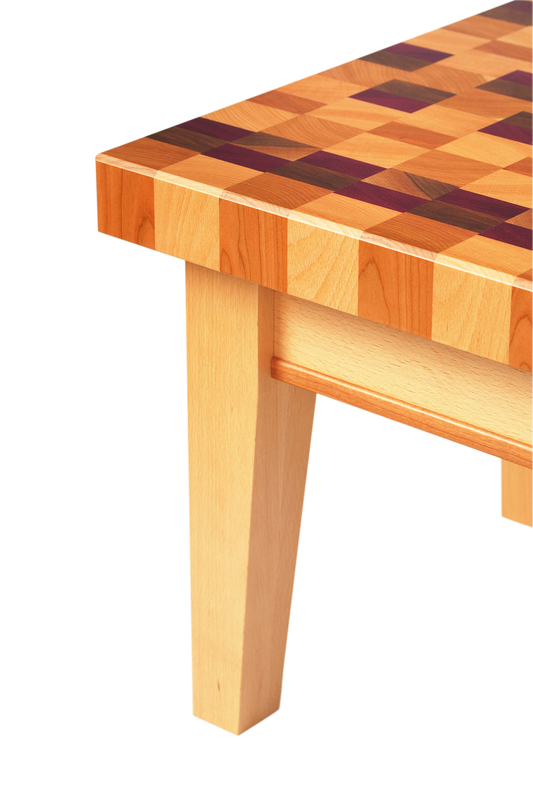 Complement the end-grain tabletop pattern with chamfers on the edges that come to a point at the corners. -You need to use water-resistant glue. -Research the toxicity of woods to be used with food-preparation surfaces. Some sources say you should stay away from certain species, such as walnut and rosewood, while others use all kinds of exotic species in their cutting boards. Research the issues yourself and do what you feel comfortable with after reading up on the possible risks. -Use a food-safe finish, such as 100 per cent pure tung oil, mineral oil or walnut oil (but keep in mind allergies to tung and walnut). Tung oil is my favourite because it cures completely. It does take several days for each coat to harden, but walnut oil can take weeks and mineral oil never cures at all. You need to reapply more mineral oil every time you wash the project with soap and water. Joint and plane strips for the tabletop, then glue them together to create the initial long-grain slab. 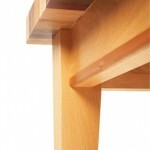 The thickness of the long-grain glue-up will determine the width of each row in the final end-grain tabletop. To calculate the length of the long-grain strips you’ll need, multiply the rough thickness of the end-grain tabletop you want by the number of end-grain rows needed for the desired tabletop length. Moreover, you have to account for the many saw cuts needed to turn the long-grain slab into end-grain rows. 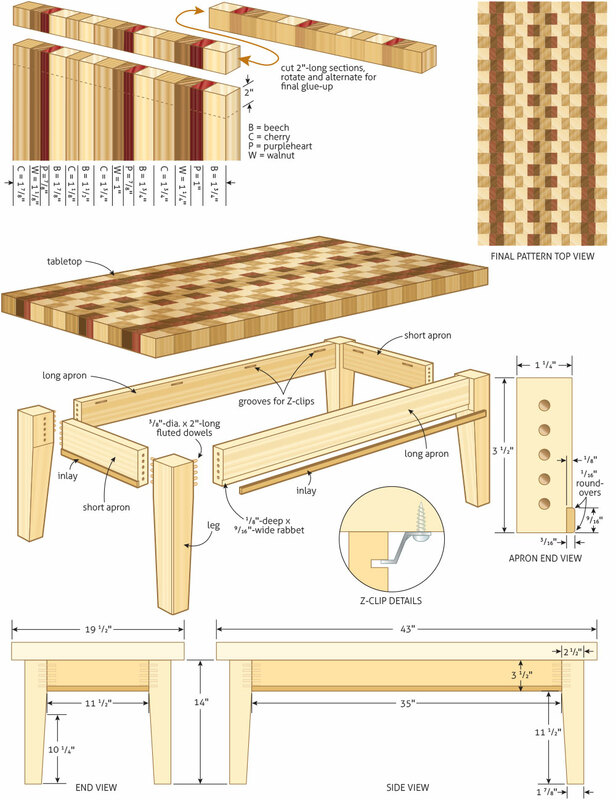 For example, to make an end-grain slab that is 43″ long, you need 21 or 22 rows, each approximately 2″ wide. If the end-grain slab is 2″ thick, then you need at least 42″- to 44″-long strips for the initial long-grain glue-up, although this length doesn’t account for the saw kerfs. You’ll make 20 or 21 cuts in all, which will remove 1/8″ of wood each time. Thus, you’ll need at least an extra 2 1/2″ to 3″ of extra length. You should give yourself even more breathing room. 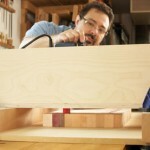 I’d aim for a long-grain glue-up of at least 50″ to 55″ in total length just to be on the safe side. Too long is always better than too short. -Orient the boards so that they will plane without tearing out. -Glue the strips together to make up the long-grain slab. 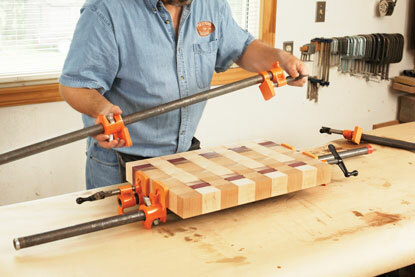 -Use plenty of clamps, alternating them from side to side. 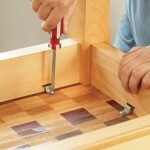 -Use wooden cauls to keep the strips as level as possible. -Clean up the glue joints before they dry, and then let the panel cure for 24 hours. After clamping the long-grain strips together, remove the squeeze-out with a putty knife before the glue has a chance to harden. The long-grain slab you’ve made needs to be levelled and cross cut into strips. These strips will then be turned end-grain up, with every other strip flipped end over end to create the final tabletop pattern. It’s exciting to see the simple long-grain glue-up become a much more complex pattern. -Plane both sides of the long-grain slab with a thickness planer, if you have one wide enough, or with a hand plane. -Cut the slab into slightly oversize strips using a cross-cut sled for safety. Do not use the rip fence. -Run each strip through the tablesaw again to get an accurate second side. 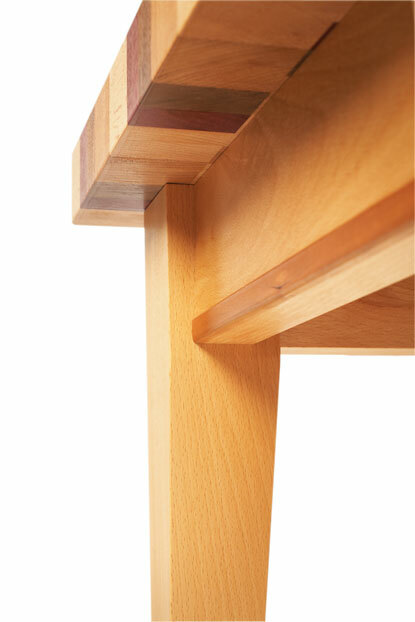 Tip: the final width of each strip determines the thickness of the final end-grain slab. To make these cuts, it’s OK to use a fence now, but use a blade guard and splitter. -Put the strips back together without glue, but orient them end-grain up. -Flip every other strip end over end to create the final pattern. Due to the end-grain slab’s length, it is hard to bring all the sawn strips together so they’re level for gluing. To help keep the strips aligned, I bored holes for three dowels across each joint. Since the edges being glued are long-grain surfaces, the dowels don’t need to be glued in; the joint will be strong enough on its own. 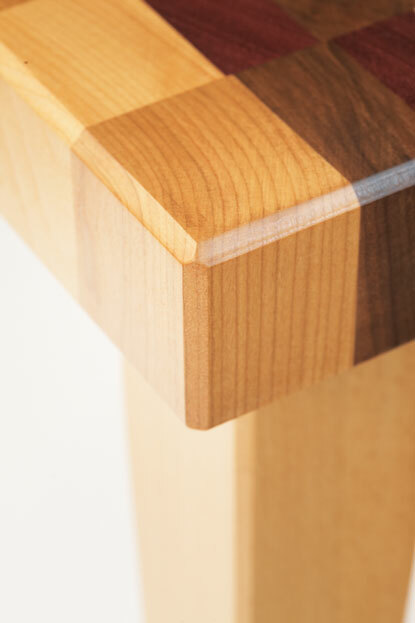 The dowels are only for alignment, saving you a ton of work in having to level the end-grain slab later. -Mark three lines across the joints spaced 6″ apart for the 3/8″-diameter x 1″-long dowels that will go between the strips. Transfer those lines down the faces of each joint with a square, then set up a fence on the drillpress to locate the dowel holes. 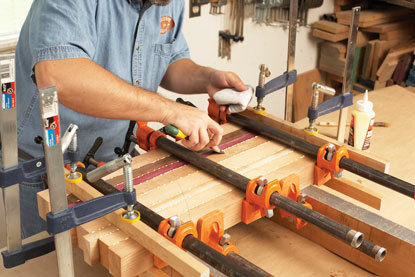 -Drill holes for the dowels on the pencil lines about 1/16″ deeper than half the dowel length. Test-fit all strips with dowels but do not glue.If all parts come together properly, take them apart, place dowels in the holes in advance and put glue on the opposite side of each strip. You can spread glue on all of the strips at the same time using a thick-nap paint roller, which will roll right over the dowel holes without depositing glue in them. 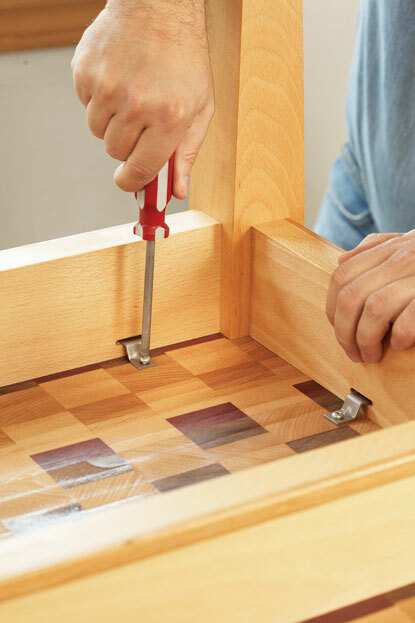 This sample slab has dowels aligning the end-grain rows, which means you only need clamps on the ends when you set this glue-up. Now that the end-grain slab is done, it’s time to level it. If your glue-up went well, there might not be a lot to do other than sanding. But if opposite corners of the slab wobble up and down on a flat surface, or if there are step-shaped mismatches between end-grain strips, you’ll have significant wood to remove. -If you know how to sharpen a low-angle block plane, try hand planing the end-grain surface. However, on end-grain, planing with a razor-sharp blade is still super-hard work. 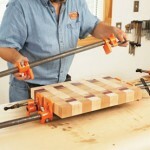 A belt sander with a sanding frame to keep it from tipping or gouging is an excellent alternative. 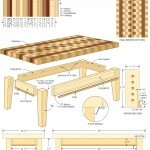 -If the slab is really uneven or twisted, you’re better off using a router jig to level the panel. -Once the slab is level, sand the surface with 80-grit sandpaper. Sand until all defects are gone, whether they be glue splotches or small areas torn out by the router. You then have to sand with the next grit higher until all scratches left by the last grit are gone and replaced with a new, finer scratch pattern. Work your way up through 100, 120 and 150 grit with the belt sander. 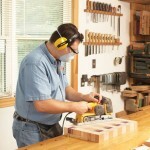 Use the random-orbit sander for 180 grit and beyond. 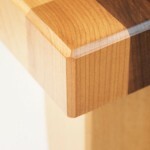 -Add a 3/16″-wide chamfer to the top edges of the tabletop with a router. 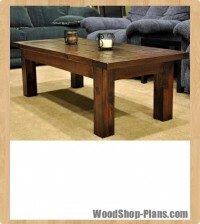 -Perform a final sanding of the top with 220-grit sandpaper. Move on to an even higher grit if you’d like a highly polished surface. As with this sample slab, a belt sander is the best tool for levelling the end-grain tabletop. Mill the lumber for the legs and aprons now. Each leg is made up of two 6/4 boards of European steamed beech, so you need to face glue the boards to get the 2 1/2″ x 2 1/2″ leg blank thickness required, then remill the wood to final thickness and width. -Cut leg stock to final length, as well as the aprons. If you want to incorporate an inlay detail into the aprons, it’s easier to cut the rabbet and glue the inlay now, before cutting to length. For simplicity, I used dowel joinery, which is plenty strong, given that I used five 3/8″-diameter x 2″-long dowels per joint. -Bore all dowel joinery holes. -Add a 3° taper to each leg. Mark 5/8″ in from the inside edge of the leg at the foot and continue the line to about 3 3/4″ from the top of the leg to get the taper. 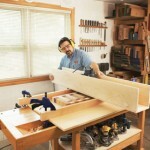 This jig is a sled that travels back and forth across two level beams, allowing a handheld router to mill a surface flat. 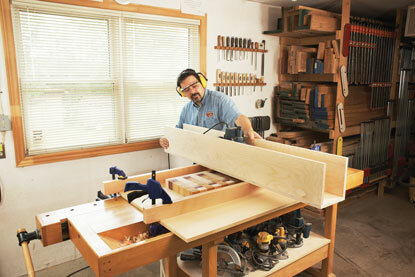 The router is fastened to the sled, and the whole thing needs to be long enough to bridge from beam to beam while still allowing the router bit to travel across the entire width of the tabletop. The jig is made of three pieces of 3/4″-thick Baltic birch plywood fastened with glue and screws. The side panels are quite wide (8″) because they provide all the vertical stiffness to the jig. The whole thing has to be rigid enough not to sag as it travels over the slab. -Make a simple platform out of Baltic birch plywood to hold a handheld router in the middle. You’ll have to remove the router’s baseplate and use screws to hold the router’s base to the platform. -Mill two straight beams that the jig can ride on, then clamp them to a flat surface, such as a thick piece of MDF. -Secure the slab to be routed to the flat MDF surface with double-sided tape. The material you are routing might be heavy enough to remain stable on its own. -If the slab is twisted, use shims at the two raised corners to stabilize it. A few business cards work well as shims. -Set a large straight bit to cut no more than 1/16″ deep—or even less—and slide the jig back and forth and side to side until you’ve routed the entire surface. If low points remain, lower the bit by another 1/16″ or so, and repeat. -Flip over the slab, secure it to the MDF base and rout the opposite face. -The slab’s surface will be flat when you’re done, but probably not smooth. You still will need to do a lot of sanding. 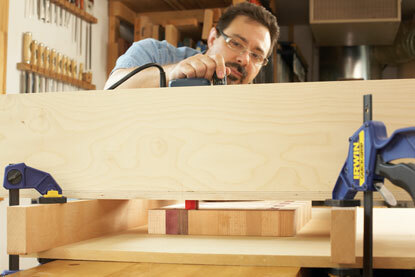 A three-sided jig on square beams allows you to move your handheld router over the slab. Control the cut by adjusting the distance that the bit protrudes from the jig. Before assembling the base, you’ll have to do more sanding. You also need to prepare the tabletop slab so that you can attach it to the base in a manner that will let the tabletop expand and contract as it needs to. I chose to use short, routed grooves and metal Z-clips. -Cut grooves on the inside faces of the aprons for the Z-shaped clips that secure the tabletop. 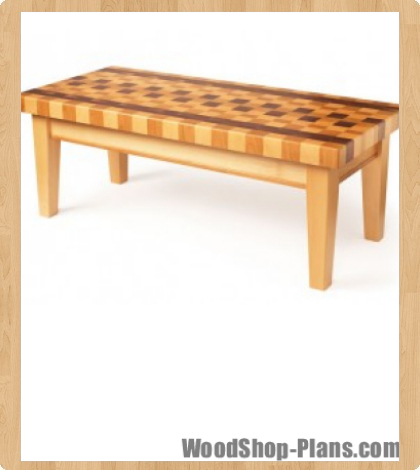 Remember, an end-grain tabletop expands and contracts in both width and length. Always fasten the clips so there’s clearance between them and the aprons. For my table, I opted for one short groove for each clip, which I cut on the router table. -Sand the legs and aprons before assembly. Start with 120-grit sandpaper and work your way up to 220 grit. 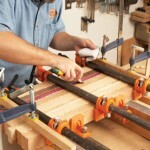 -Glue up the legs and aprons in stages, using pads on the clamps to avoid damage. I prefer to glue up the long aprons to each pair of legs first, and then glue the two halves of the base assembly together with the short aprons the next day. -Place the base assembly upside down on the underside of the tabletop and drill holes to attach the Z-clips. Remember that these clips should be positioned only midway into the grooves to allow for wood expansion. After testing the fit, remove the clips and tabletop. It is easier to finish the tabletop and base separately. I liked this cherry detail at the bottom of each of the beech aprons. I’ve called it an “inlay,” although it is glued into rabbets in the bottom outside edges. -Cut a rabbet down the length of the bottom front edge of each apron using a table-mounted router or a dado blade set in a tablesaw. -Saw the inlay stock to final thickness, leaving a little extra width and length. -Rout a decorative curve on the top edge of the inlay and then glue it into the rabbets. While the inlay might seem quite thin to push across a router table, it can be done safely with a couple of featherboards to hold the stock down on the table and against the fence. Use a pushstick so your hands don’t get anywhere near the bit. -Plane off the bottom edge of the inlay flush to the apron. 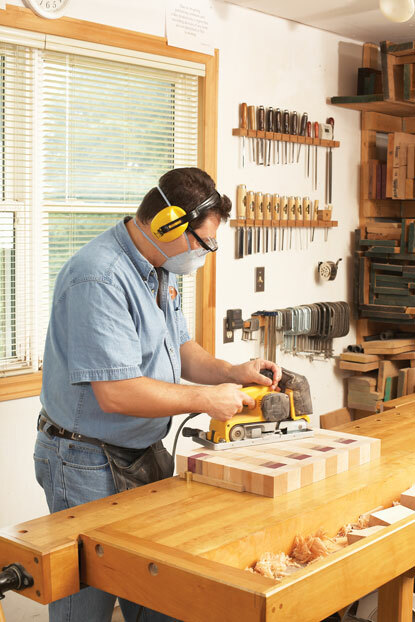 You can use a router with a flush-trim bit, a hand plane or even a jointer. Rout a small roundover profile on the bottom edges of the inlay strips. -Cut the aprons to final length now if using dowel joinery, as I did. It’s easier to glue the inlay strip while it is extra-long and then cut the apron to final length afterwards, cutting through both apron and inlay at the same time. For maximum protection and to limit wood movement, I applied 10 coats of oil-based varnish. That sounds like a lot, but end-grain is thirsty. A generous film finish gives some scratch protection while also bringing out the different colours of the wood. 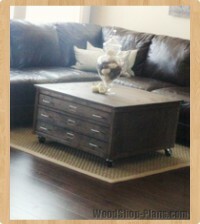 -Remove sanding dust with a tack rag or mineral spirits. 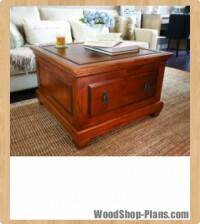 -Apply about five coats of oil-based varnish to the base. 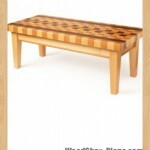 -Apply as many coats to the tabletop as required to make it look even and to fill in all of the end-grain pores. 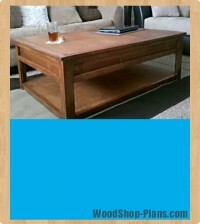 For my table, I applied 10 heavy coats, followed with one buffed coat of paste wax. This project is very satisfying to build. The base assembly can be as simple or as complicated as you want. While the tabletop is a lot of work, the final pattern is incredible and makes people think that you actually glued each piece individually. You won’t believe the compliments you will get. Z-clip fastens the tabletop to the aprons and addresses seasonal wood movement.